(Bloomberg) -- Big bank shares declined in early Monday trading, as better-than-expected first-quarter earnings per share and fixed-income trading gains from Goldman Sachs Group Inc. and Citigroup Inc. failed to cheer investors focused on the forward look. 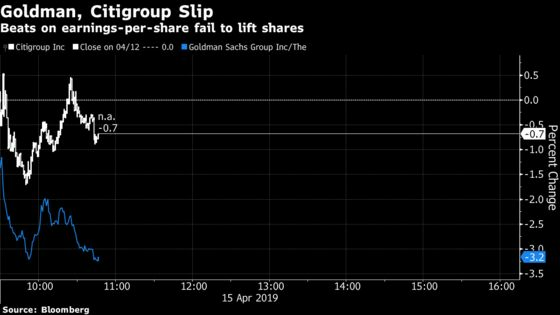 Goldman fell as much as 3.2 percent, the most intraday since March 22, after it said ts investment banking transaction backlog fell compared with the end of 2018. 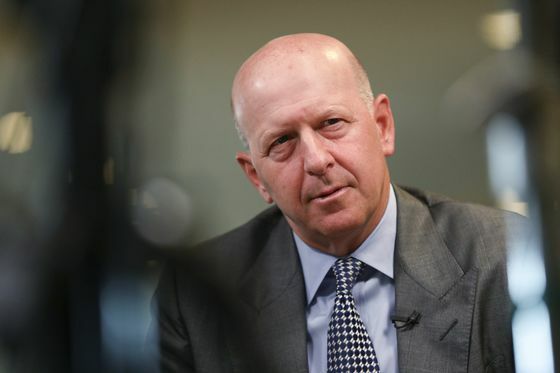 Chief Executive Officer David Solomon called the year’s start “muted,” and said the bank is “focused on new opportunities to grow and diversify our business mix and serve a broader range of clients globally,” which may not have been what investors wanted to hear. Goldman had “no Tiger at Augusta” moment, Evercore ISI’s Glenn Schorr wrote in a note, though it showed “some signs of a comeback.” He cited better client activity levels throughout the quarter, and said litigation reserves of just $37 million may be “a sign that management has a handle on 1MDB.” Those reserve may also just mean that the impact of the Malaysia scandal on reserves isn’t “estimable or probable at this point,” Schorr added. Citigroup swung from losses to gains, and then back to losses, on Monday after Chief Financial Officer Mark Mason on its conference call said they’ll generate at least $2 billion of growth in net interest revenue. This was in line with JPMorgan Chase & Co., which said it’s expecting net interest income, or NII, growth this year. Wells Fargo & Co., on the other hand, had lowered its NII guidance to a decline of 2 to 5 percent, sending its shares into a tailspin on Friday. Though they beat, Citigroup’s results were “provision and tax rate driven,” which will be “viewed as lower quality,” KBW’s Brian Kleinhanzl wrote in a note. He added that credit losses were worse than estimated and net interest income missed, as the net interest margin beat, but average interest earning assets were below expectations. Citigroup’s securities and loans missed KBW analysts’ forecasts, too, while average loans were up 2.2 percent compared with the prior quarter, when KBW had been looking for 4.4 percent growth. JPMorgan’s solid results on Friday may have led to some optimism for both Goldman and Citigroup, “making disappointments on the equity trading side more meaningful today,” Bloomberg Intelligence’s Alison Williams said. And Wells Fargo will face significant uncertainty as long as its chief executive officer overhang continues, she added. Wells Fargo erased earlier declines to rise as much as 0.8 percent in early Monday trading. Shares had slipped after Goldman, BofAML and Buckingham all cut their ratings. Wells Fargo is “likely to remain ‘dead money’ and lag peers until there’s greater clarity around revenue inflecting,” Buckingham’s James Mitchell wrote in a note. The two big banks yet to report, Bank of America Corp., which is due on Tuesday, and Morgan Stanley, due on Wednesday, were also falling on Monday morning. BofA shares dropped as much as 1.6 percent, and Morgan Stanley fell as much as 1.4 percent. In a note about Wells Fargo’s disappointing results, Macquarie’s David Konrad warned that the flattening yield curve “may also be problematic for peers.” Macquarie was most concerned about BofA, and Regions Financial Corp. and Huntington Bancshares Inc., which report later this month.